With a clear coating, you can reinforce your home against the risk of damage to your walls and foundations with a coating that offers long-term protection and peace of mind. Clear coating is exactly as it sounds – a protective wall coating that doesn’t involve changing the way the exterior of your home looks. Layer your walls with a clear waterproof coating and protect the outside of your house without having to change its appearance whatsoever! Our transparent coating technology does not compromise on quality. It is primed to stop the effects of damp infiltration and the erosion and damage of brickwork, meaning you never have to be afraid of the weather damaging the exteriors of your home again. At All Weather Coating, we know how to apply the clear coat to the highest standard and only use the best quality clear coat paint, ensuring your home is given the care and due diligence it needs. 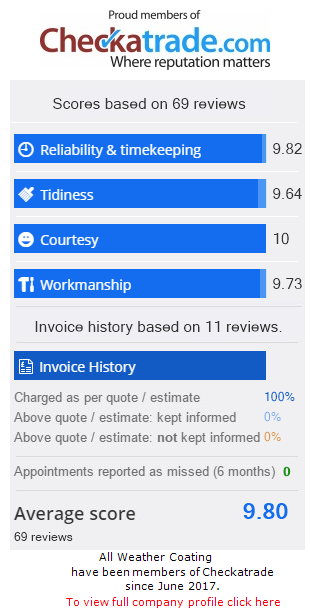 Despite this, we keep our prices competitive and can assure you won’t be beaten on any price – contact us today if you think you’ve found a better offer and we will match it instantly! The silicone within the clear weatherproof coating we use forms a protective bond around the brick to ensure nothing passes through that could cause potential damage. No chance of water seeping through your brickwork means zero chance of damp causing damage to your home – all you’re left with is a beautiful clear coat finish. Based in Buckinghamshire, we offer our clear coating service in London and the Home Counties. if you like what we’re about and want to book yourself a free no obligation quote from us, or you want to know a little more about who we are and what we do – we’re just a phone call or an email away. For those in the market for a waterproof coating that includes a fresh coat of paint, check out our exterior wall coating service for a fantastic waterproof coat of paint that adds a bit of colour to your home – sleek style with a great sense of utility all in one!